The Oscars have come and gone and I’m still making my way through the films of last years’ Oscars. You can thank the $20 movie tickets in Japan. And unless it’s a blockbuster, you’ll be watching films released a half year later than in the US. The most affordable way to see movies, legally that is, is to wait until the DVDs come out for rent. I happened to see two such movies, Slumdog Millionaire and the Brothers Bloom days apart and was struck by the similarities between the two. It’s remarkable how far the parallels go in these two visually different films. 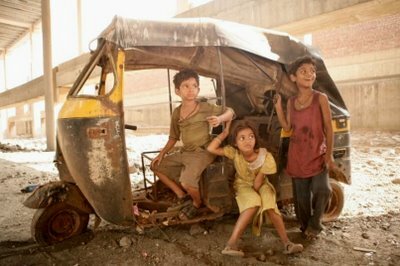 Slumdog Millionaire is a Peter Boyle film set in the slums of Bombay, following the tragic trials of two brothers, orphaned and living on the streets. 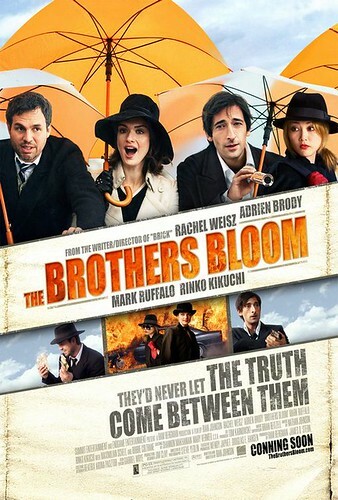 The Brothers Bloom tracks the more light-hearted capers of two brothers, also orphaned, as they pull off elaborate scams to make a living. Both sets of brothers are taken in by a crime lord specializing in exploiting streets kids. And both use their street smarts to survive in a cruel world. The older brothers are wily, amoral, and are clearly the bad apples of each pair, while the younger brothers are the reluctant soulful partner in crime. Both younger brothers are unwilling participants in their older brothers’ scheming. Both older brothers, by the end, turn themselves over to dangerous, powerful underground figures to secure (or so they believe) the safety and happiness of their younger siblings. But this turn to deeper involvement in lawlessness ironically alienates the younger brothers even more. One of the main conflicts of both movies is the rift that tears the brothers apart, mostly due to the younger’s rejection of their seedy lives. Yet the older brothers submit themselves to further corruption to ensure the well-being of their kid brothers. And in the end, they sacrifice their lives so that the younger brothers can maintain their innocence and live happily with the women they love, freed of a corrupting life. While the narrative arcs and characters are similar, these two films couldn’t be more different in tone and look. Slumdog has the unrelenting hyper-real grittiness of City of God (a Brazilian movie set in the slums of Rio). And Bloom prances along like the playful quirky Amelie. Also, the way the women are portrayed are markedly different. 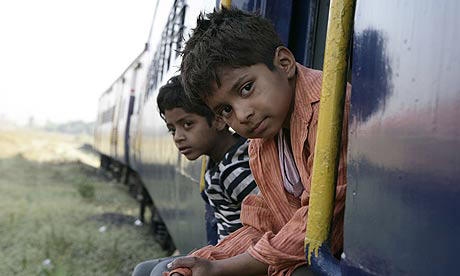 In Slumdog, the object of Jamal’s (the younger brother’s) affection is Latika. And that’s about the extent of her character, as the pretty face who is the object of desire. As a fellow orphan, Latika symbolizes the stability and goodness of their childhood slums. However, her character is undeveloped, as we don’t know anything about her former family, nor her desires or dreams. Latika has no agency. She relies on the boys and men around her to give her shelter, rescue her, imprison her, and use her. In fact we don’t know if she’s capable of anything on her own. She does try to escape her servitude to the local gang lord but it’s through Jamal’s encouragement or with the older brother’s help. She’s a peripheral prop that propels the plot (say that five times) by giving the lead a romantic motivation. She could have been any girl, albeit a strikingly beautiful one. In contrast, Bloom has two vividly drawn women. One is the brilliantly played Bang Bang (Rinko Kikuchi). She speaks three words in the entire movie, but is a palpable presence. Even though we don’t know much about her background, except that she’s an explosives specialist, she exudes a cool mystery. She comes and goes as she pleases and is a partner in the brothers’ antics. The other women in Bloom is Penelope. 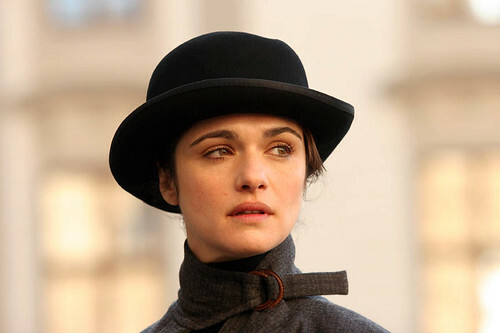 She is fully fleshed out in one of Rachel Weisz’s best roles. Imagine Amelie with an inheritance. Socially inept, she plunges into various hobbies and masters them all. She demonstrates many of them in one of the best montages of the film. Interestingly, she is also parentless, thus completing the trinity of orphans for both movies. The women of Bloom are central to the story. In fact, they steal attention from the leading men. Their agency is expressed through actively driving the scams put on by the brothers. They choose to join in on the cons as willing participants, and influence the decision-making process. To be fair, it’s hard to compare the agency of a millionaire heiress and an explosives expert to that of an orphaned girl from the slums controlled by crime bosses from childhood. And I don’t have a problem with characters that drift along. Some people are passive and others are not and that’s life. But it would have added depth to know whether Latika had also yearned for Jamal, or had tried to find him, or if she had given up hope. 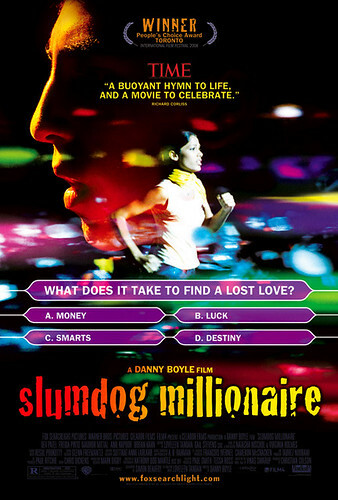 Slumdog Millionaire was more complete as a film, had an engrossing pace, and was cleverly written. The original use of quiz show questions to drive the plot is an inspired story structure. It also paid homage to elements of Bollywood, with over the top theatrics, and even a dance at the end. The Brothers Bloom was more flawed. Too much time was spent on the younger brother’s obsessing over his lack of meaning in life. Instead of eliciting sympathy, he comes across as a moody ingrate. Many of the exchanges between the brothers could have been cut. 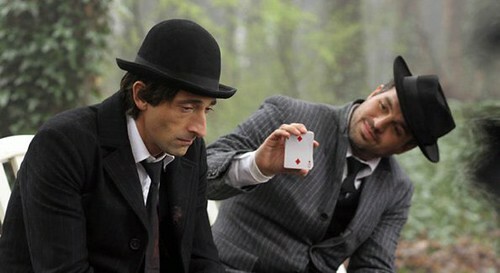 The film should have focused on being whimsical, instead of wavering between whimsy and tortured. And by whimsy, I mean the quirky female characters were the most entertaining elements in the film. I also found the metanarrative fascinating. The older brother designs cons with elaborate story lines to ensure the happiness of the younger brother, by making him the center of the plot, complete with happy ending and the girl. But the younger brother is bothered by this false pre-ordained life. We are asked the question, would we prefer to live a wonderful life that someone else had plotted for us? Or would we rather risk an unfulfilled life but of our own choosing? Like any work of art, both movies have flaws but I recommend them both because they’re well made, beautiful to watch, and have entertaining stories. Aww, look at those sweet kddois. Love sibling shots like this, such precious interactions!